"Good show ! Keep it up"
"Good experience. Willing to order more.."
"Good service n I really luv ferns & petals😊👍🏻"
"Good service and prompt delivery. Keep it up." 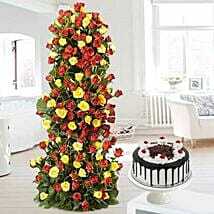 Gifts are a way of expressing your love and affection to your friends, families and relatives. The joy it brings during several occasions is simply immeasurable. 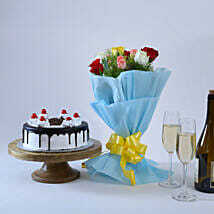 So, be it Birthday, Anniversary, Valentine’s Day or any other party or celebration choose from the choicest selection of combos. 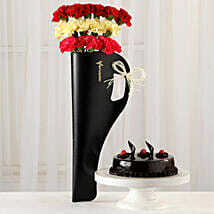 Combos are the best-suited gifts to be given during such occasions. 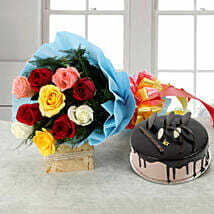 You can buy cakes and flowers online which can be gifted to the one you love. At Ferns N Petals, we have come up with a whole range of best gifts for you to choose from and deliver it at your loved one doorstep. 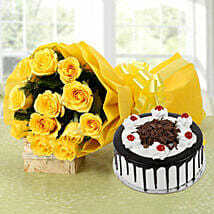 You can go for online cake and flower delivery with our express delivery option which allows you to send gifts the same day and even at the fixed time. 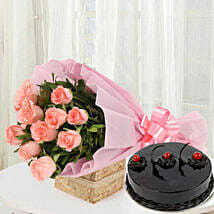 Both flowers and cakes are wrapped beautifully to ensure that the best combo gets delivered at the doorstep. Amongst the best cakes that we have baked, Red Velvet Cakes are the most ordered ones. You can get a red velvet cake online delivery for a Birthday or Anniversary which is the best-suited cake for the particular occasion. At Ferns N Petals, it has been our constant endeavor to strive for perfection; hence we ensure that fresh flowers and cakes are delivered to your loved ones. 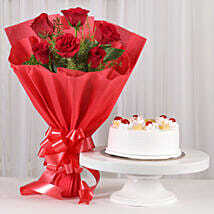 You can buy bunch of flowers online and can deliver it to a destination of your choice. We have covered more than 350+destinations and have been serving our customers for more than 20 years and our timely delivery of gifts makes us the most trusted brand amongst our customers. Every woman plays different roles of being a wife, sister, and daughter. Being a mother is the most pivotal role that any woman plays in her life. She not only loves her kids more than anything else in the whole world but also devote her entire life to raise, guide, and support them at every step. She teaches her kids to be their best version and always work towards making this world a better place for them. 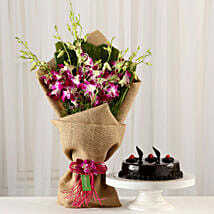 This Mother’s Day, tell your mom how much you value her presence in your life with lovely gifts. Ferns N Petals brings to you a varied range of fabulous and affordable gifts for Mother’s Day that you can offer your mom along with a warm hug. We also offer the best Mother’s Day flowers and cake combo that are sure to add more colors and sweetness to the celebrations. 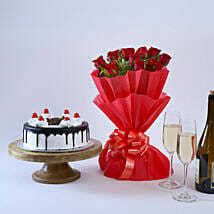 You mum will be quite excited about receiving such lovely presents and she will cherish them with all her heart. Loved ones of yours may be residing far away from you, anywhere in India. And at the moment your reason of disappointment is that you can’t visit them, during an occasion or festivity that means the world to them. But with the prospects of cake and flower delivery resting on your fingertips, you can now send them a token of your blessings and wishes. When it comes to the Indian sub-continent, then Ferns N Petals is the very name that has been harboured in the hearts of infinitesimal individuals, since time immemorial, when it comes to providing charm to special occasions and festivities. We all are very much familiar with the fact, that for any occasion that might be transpiring, the culminating essence of the delicacy of a cake and a congregation of beautiful fragrant flowers, accounts for an apt gift when it comes to charming the receiver in the best manners possible. And our company tends to aid you in this endeavour, by providing you with the best varieties of both. As of now our provisions have been well received and appreciated, for our pledge towards customer satisfaction and happiness, clearly, reflects in the number of our patrons and followers. Hence, your loved one might be residing anywhere in India, he/she shall never be able to elude your generous offerings. 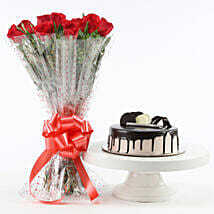 Our online platform is booming with options that account for subtle choices when it comes to cake and flower delivery. When it comes to the delicacy of cakes, we sure do harbor an assortment of them that are available in varying flavors that account for their delectable taste. So whether you opt for a chocolate cake of the like of fudge, truffle et al, or whether you go for a cheesecake that comes accompanied by flavors that boast of blueberries and strawberries, we harbor the rarest, we harbor the most delicious, in short, we harbor them all. So is the case when it comes to flowers, from beautiful bouquets and vases that comprise of a never ending variety - from an assortment of roses that vary in innumerable colors to dainty tulips, from slender daffodils to the radiance of sunflowers - you shall never fall short of choices, but whatever choice you may abide by, shall be nothing short of being a fine one, full of beauty and class. And it surely gets better, because our company believes in polishing the act. Hence, accompanying the prospect of flowers and cake delivery is the option of adding an assortment of chocolates and soft toys for your loved ones that shall delight them to the core. When it comes to our company, it surely tends to get better with every occasion, with every choice that you make, with every offering you send. Hence, if you want to send a cake and gifts to Delhi or flowers to Hyderabad or any other city, we shall assist you with all, for aiding your happiness to fulfilment is our primary motif. 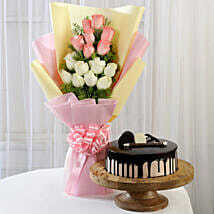 Planning to Send Cakes and Flowers to Specified Location?